Nelrene is a Dark Seducer guard posted in the House of Dementia. Although Lady Syl must hold her in high esteem, that does not stop Nelrene from conjuring up murderous schemes against her. During the related quest it will be up to you to uncover her plotting. Nelrene lives the monotonous and repetitive lifestyle of a palace warden and spends most of her time guarding the House of Dementia. At 6am, she will travel to her daytime position and will spend the next twelve hours standing guard next to the door leading to the palace grounds. Between 6pm and 8pm, she enjoys a break and will wander around the building. From 8pm onward she will be found on picket in front of the door leading to the inner gardens. She is so absorbed by her sentry routine in fact that she doesn't find to time to either eat or sleep. 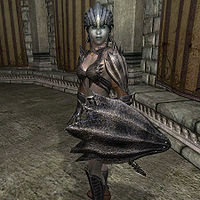 She wears a full suit of Dark Seducer armor, a Dark Seducer shield and a Dark Seducer helmet and wields a Dark Seducer weapon. All of these items are of the best possible quality for your level. During the related quest, you will team up with sadistic dungeon keeper Herdir who will never hesitate to use torture in order to get what he wants. With only a condescending: "What do you want?" from Nelrene, it is time to investigate the other people around Syl. After a painful interrogation of Anya Herrick and a failed attempt to get the truth from main suspect Ma'zaddha, it is time to torture innocent Crucible citizens to learn what Ma'zaddha is doing at night. During these sessions it becomes apparent that four citizens have seen Nelrene and Ma'zaddha together. Caldana Monrius will say: "All right, all right! I've seen Ma'zaddha, yes. Talkin' to that Seducer, Nelrene. All secretive-like, out in the street late at night. I don't know nothin' else, honest." Hypochondriac innkeeper Sickly Bernice will break down and say: "Torturing a sickly old woman? Are you trying to kill me? I don't know anything, not for certain. I hear that Ma'zaddha has been seen talking to Syl's Guard Captain, Nelrene, but I haven't seen them." while Cutter finally feels too much pain: "Just stop it! Ma'zaddha and Nelrene... They meet in the street during the night. No one knows what they talk about. That's it. That's what you want, isn't it? Now leave me alone!" Local beggar Bhisha also noticed the strange gatherings at night: "I don't want trouble! I keep to myself, but I see Ma'zaddha and that Dark Seducer, Nelrene, meeting behind the buildings late at night sometimes." Nelrene: "Have you made any progress? Will Anya assist us?" Ma'zaddha:"No, that blasted Inquisitor got to her. We'll need to find someone else." Nelrene:"See that you do so immediately. This is the one task which you were assigned. If you cannot complete it, you will be removed. Are we clear?" Ma'zaddha:"I will, I will! I want to see Syl dead just as much as you do. She cannot be allowed to survive, after what she's done. It's despicable." Nelrene:"Good. I shall expect a progress report soon. And keep your head down; the Inquisitor must not become involved." At 4am, after five hours of plotting or if you overheard the secret conversation, she returns to her duties in the House of Dementia. If you interrupt the meeting by talking to her, she will more or less ignore you and head back to her duties with the words: You should not be here, Inquisitor. "Perhaps you are lost? I have business to attend to. Excuse me." After successfully eavesdropping on the two conspirators, you can choose to speak with either participant; speaking to Ma'zaddha first will have him break down and cut you a deal: "I don't know, besides Nelrene. She's taking orders from someone, but won't tell me who." Confronting Nelrene first will net you nothing but denial: "I hope for your sake you are not accusing me of anything." When you tell her about the meeting, she will coldly respond: "Did you? And you have proof of this? No, you don't, do you? Well, then you'll get nothing out of me." When tortured, she will step forward and tell you: "Your efforts are futile. You'll get nothing from me!" When asked about the Conspiracy again, she will repeat: "You have no proof! You cannot hold me accountable for anything!" After three painful lessons in pain from Herdir, Nelrene will finally break down: "Argh... Very well. I am part of the group that wishes to see Syl drowned in a pool of her own blood. But I am not in charge. You want the leader. You want Muurine. But no amount of torture will get a confession from her. You'll need more than just my confession. You'll need evidence, and I have none." This basically means you will have to confront Ma'zaddha, who will cut you the same deal and end up dead. 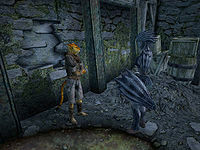 If you didn't torture Nelrene first and made her confess, you will have to find her ceremonial shortsword and the confession of a desperate Khajiit in the late Ma'zaddha's house; presenting her with the evidence will cause her to confess differently: "And with it, you'll do what? I'm not even the one you want. Muurine is behind it. You'll need solid proof to pin it on her." Regardless, once all the evidence is collected and you're ready to tell Syl about Muurine, you can ask Nelrene one more time about the Conspiracy, to which she'll respond in a particularly snippy tone: "You already know my part in this. There is nothing more to say." After the quest is completed, Nelrene is disabled and can't be found anywhere in the game. Nelrene can be asked about Brithaur once the player overhears the rumor associated with his quest, and is one of the few Dark Seducers in the game that can be spoken to about this topic, along with the cut Dark Seducer NPC known as Brevi. This page was last modified on 14 October 2017, at 22:01.